[167 Pages Report] The low voltage disconnect switch market is projected to reach a market size of USD 3.51 Billion by 2021 from an estimated value of USD 2.81 Billion in 2016 at a CAGR of 4.5% during the forecast period. The low voltage disconnect switch market is broken down into several segments; Type (Fused and Non-fused), by Mount (Panel, DIN Rail and Others), By Voltage (0-240V, 240-480V, and 480-690V) By Application (Industrial and Commercial) & By Region (North America, South America, Europe, Asia-Pacific, and the Middle East & Africa). The key players in the market have been identified through secondary research, while their market shares in respective regions have been determined through both, primary and secondary research. 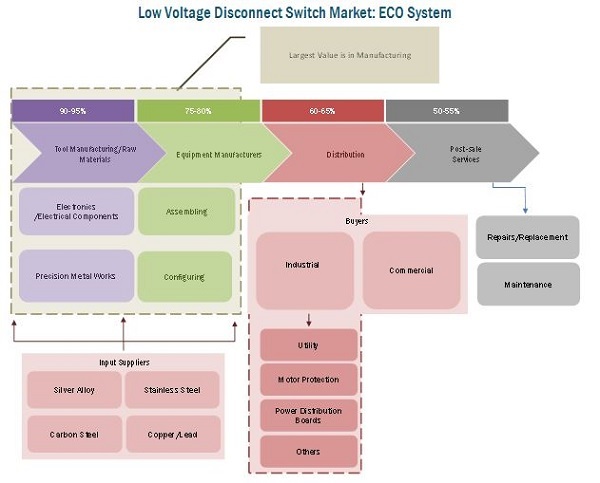 The research methodology includes the study of annual and financial reports of top market players, as well as interviews with industry experts (such as CEOs, VPs, directors, and marketing executives) for key insights (both, quantitative and qualitative) into the low voltage disconnect switch market. This was further broken down into several segments and sub-segments on the basis of information gathered. The global low voltage disconnect switch market is segmented based on type into fused and non-fused switches. The market has been segmented on the basis of mounting techniques into panel mounted, DIN rail mounted, and others, where others include base mounted and floor mounted. The market is further segmented by voltage into 0-240V, 240-480V, and 480-690V. The major applications covered in this report are industrial and commercial applications. Industrial applications are further sub-segmented into utility infrastructure, motor protection, photovoltaic (PV), distribution boards, and others, where others include infrastructure and transportation. Regions considered are North America, South America, Europe, the Asia-Pacific, and Middle East & Africa. The report also segments the low voltage disconnect switch market on the basis of its type; fused and non-fused. The non-fused disconnect switch market is expected to register high growth due to the increase in industrial activities in developing countries. The global fused disconnect switch market share is declining as this type is being replaced by non-fused disconnect switches due to the use of other protection devices along with the disconnect switches. In terms of mounting techniques, panel mounted and DIN rail mounted are two mostly used configurations to mount disconnect switch components. Panel mount dominated the low voltage disconnect switch market in 2015 and is expected to maintain its dominance throughout the forecast period. However, its market share is expected to decline by 2021 due to the increased use of DIN rail mounting in industrial applications. The report segments the global low voltage disconnect switch market based on regions into the Asia-Pacific, North America, Europe, South America, and Middle East & Africa. The market has also been analyzed for key countries in each region, such as the U.S., Canada, Mexico, China, India, Japan, Australia, Germany, the U.K., France, Brazil, Saudi Arabia, Kuwait, and UAE, among others. The applications areas vary with the specified voltage ratings of low voltage disconnect switches. 480-690V disconnect switches which hold major share over other voltage ranges are largely used in distribution, photovoltaic, infrastructure, light commercial and light manufacturing applications. However, the disconnector switch market is characterized by a large number of market players including local as well as global players. The local players provide cheap and low quality products when compared to the global firms. The local players take advantage of local distribution channels, as the market is very fragmented and highly competitive, given the number of local and global players. 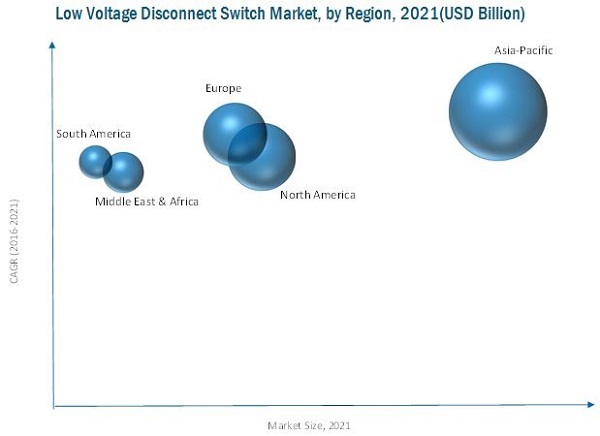 Some of the leading players in the low voltage disconnect switch market include Eaton Corporation (Ireland), ABB Ltd. (Switzerland), Schneider Electric SA (France), and Siemens AG (Germany), among others. New product development was the most commonly used strategy by top players in the market, constituting half of the total development share. It was followed by partnerships/ agreements/collaborations, expansions, and other developments.